5 Should you buy them? If you peruse our Winter 2018 Most Wanted audio guide (and you should — good stuff in there), you'll notice an unfortunate trend. With few exceptions, manufacturers of wireless audio gear seem timid about adopting USB Type-C charging. So I was excited to get my hands on the Rowkin Ascent Charge: they're fully wireless earbuds whose case is decked out with not only the increasingly standard USB-C, but also Qi wireless charging. And after using the buds for a couple of weeks, I like them a lot, but a few grating flaws are stopping me from loving them. Charging Everything should use USB-C at this point, and Qi is a nice bonus. Connection strength The Ascent maintain a solid connection at impressive distances. 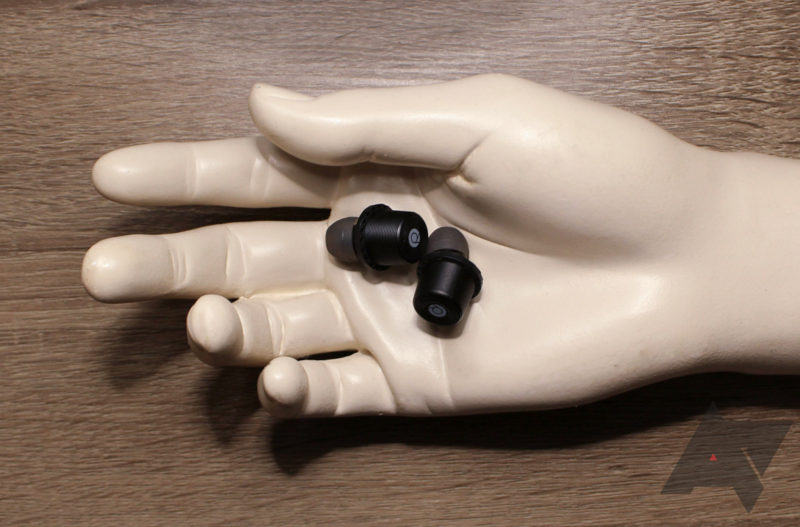 Price As reviewed, the earbuds currently go for $129.99, and you can get them for even less with different options. Battery Rated for 3.5 hours per charge, which is already meh, but comes in closer to 3. Software Pairing can be a pain and the app isn't very useful. Touch controls Finicky at best. 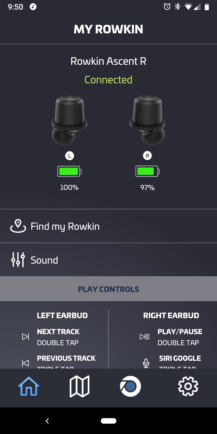 Rowkin's Ascent earbuds come in three varieties, but the buds themselves are all the same. They're unassuming, stubby cylinders, weighing less than a quarter-ounce apiece. 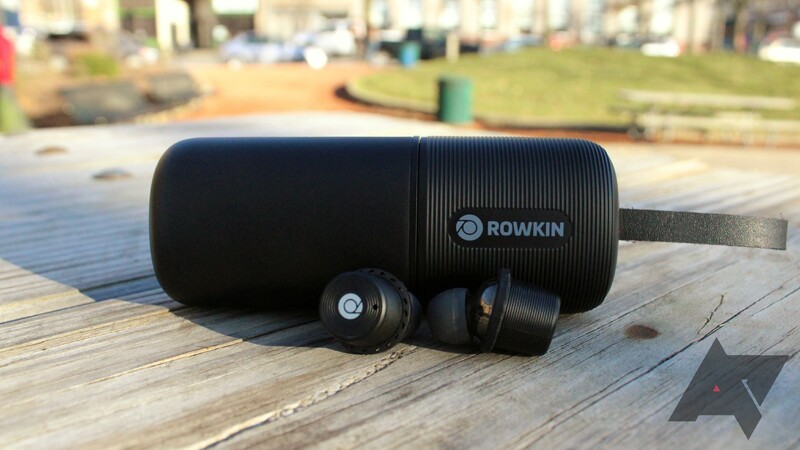 Rowkin says they're the "smallest sport Bluetooth 5.0 true wireless earbuds," which is kind of a meaningless distinction. They really are small, though, at just 15.5 by 23.5 millimeters, and their lightness means they're not distracting in your ears. The Charge distinction means the buds come with a Qi-equipped 1,900 mAh charging case, as opposed to the Ascent Micro, which have a smaller 870 mAh case without wireless charging. 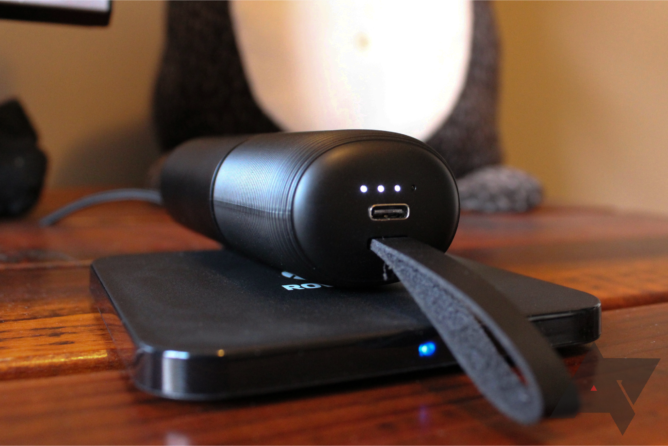 The Charge+ also packs a wireless charging pad in the box. None of the models include a wall plug, which is a little annoying, but they do come with a USB-C-to-USB-C cable and a full-size USB adapter, so you can use one of the 50 chargers you already have. There are three sets of silicone tips included; for me, the pre-installed medium size fit snugly enough that I never thought they'd fall out during stationary listening or exercise, but I don't know that I'd trust them to stay in place if I were running outdoor trails. Each bud houses a "premium mylar diaphragm driver" and a 60 mAh battery, and there's a touch pad on each to control all the normal audio business like play/pause and skipping tracks. Touch controls aren't implemented very well; the pads don't feel sensitive enough, and all too often fail to register the required double- and triple-taps. They're IPX5 rated, though, which means they should survive sweat or rain. The charging case is four and a half inches long and sort of a flattened cylinder. One end houses the USB-C charging port, four LEDs to indicate the case's battery level, and a leather strap. (I'm not entirely sure what the strap is for; one marketing image shows it attached to a carabiner, but that seems like a pretty niche use case.) You can also use the case to charge other devices like smartphones, which is a neat feature. 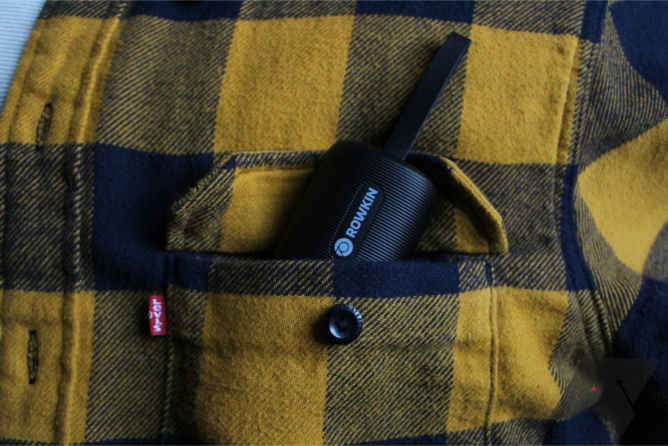 You pull the Charge case open horizontally to reveal the buds inside. The action isn't particularly satisfying — there's a lot of resistance to start pulling the halves apart, so it's hard not to slam it open every time. The case isn't terribly cumbersome, though, and its long, rounded shape means it fits easily into all but the snuggest of pockets. My Charge+ review model came with a wireless charging pad in the box (the non-plus Charge does not). It's a black plastic square, completely nondescript save for the Rowkin logo in its center. It works, but it feels really cheap; it's feather-light, and there's noticeable give if you press down on its surface. There's also an annoyingly bright, always-on LED on the front of it. The only reason for the light seems to be to indicate when you've placed something on the pad that isn't charging; that'll make it turn red. The rest of the time, whether the charger is in use or not, it's blue. This seems unnecessary, as the LEDs on the case light up while it's being filled and stay off while it isn't, and makes it unsuitable for use on a bedside stand. The Charge case is Qi-equipped, but the wireless charging pad included in the Charge+ bundle is nothing special. Rowkin has an app to complement its earbuds, but there's not much to it. Like Jaybird's companion app, it'll show you the battery level of each earbud, and you can use it to customize their EQ settings. 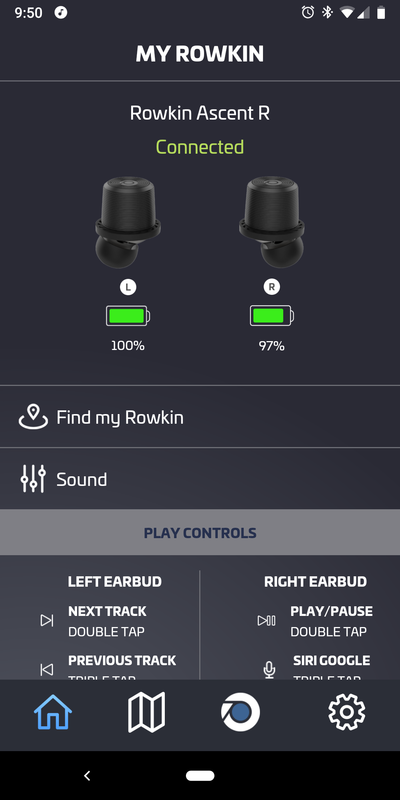 Unlike the Jaybird app, though, customization in Rowkin's software is limited to a handful of presets like "rock" and "bass booster," and the differences between them seem so subtle, I question whether they do anything at all. One nifty feature is that you can use the app to see approximately where you last used your buds — it won't help you locate them in your couch cushions, but you'll be able to see whether you left them at your office or the gym. "Find my Rowkin" feature not pictured, as it's just a list of addresses I frequent and my home's location on a map. 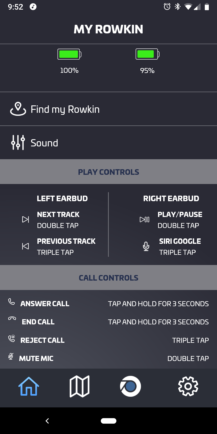 With a single exception, the sound the Rowkin Ascent put out is surprisingly robust. 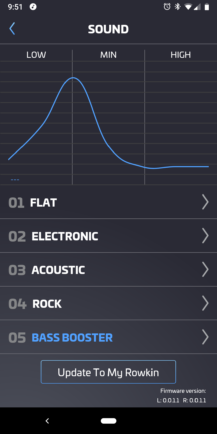 Highs, mids, and lows are accurately represented, and there's considerably more bass than I'd expected; in certain tracks, you can actually feel the bass in your ear. Everything I listened to — rock, folk, hip hop, pop, jazz, you name it — sounded the way it should, with bright highs and deep lows. Viability for phone calls was another unexpected strength. Callers said they could hear me more or less as well as they would've been able to if I hadn't been using earbuds at all. The one flaw I could pick out is that there's a sort of crackly distortion in certain medium-high tones; it's at its worst in cymbals and some vocals. It's not terribly prominent, but it's one of those deals where once you hear it, you can't un-hear it, and it really mars an otherwise great listening experience. But you probably won't notice it unless you're listening for it. There are a lot of high points about the Rowkin Ascent ... But that there's so much to like just makes the lows that much more frustrating. Maybe. There are a lot of high points about the Rowkin Ascent: they're tiny, they're comfortable, they sound great (for the most part), and they're priced right. They're also connectivity strength champs, maintaining a solid connection to my phone through walls and across impressive distances. But that there's so much to like just makes the lows that much more frustrating. Aside from the minor distortion in some tones, pairing can be a pain; I always had to turn the buds off and back on again before I could get audio out of them after connecting to a new device. They're quirky about Chrome OS, too — on my Pixelbook, I couldn't adjust their volume. Battery life isn't stellar, either. The Ascent are rated for three and a half hours of playback time, but at half volume, mine gave out at three on the nose. 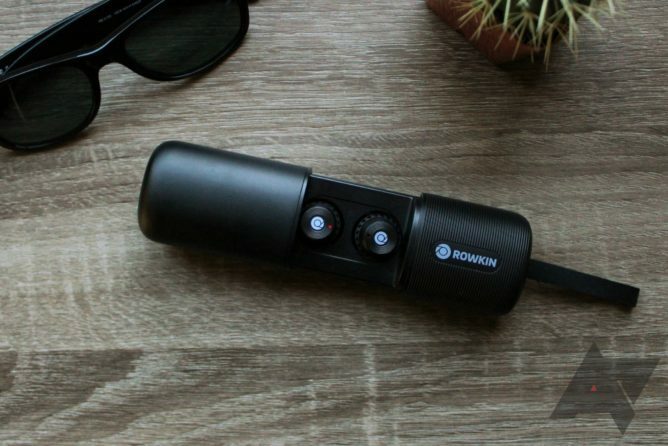 The Charge case can fill the buds up about 15 times, which makes for 45 hours of listening without plugging in (or plopping on a Qi pad), mitigating battery concerns to an extent. USB-C is mandatory on just about any device I buy at this point, and it's great that the Ascent have it. Wireless charging is nice, too, but to me, the value it adds isn't worth the jump from the less expensive Ascent Micro — which, as of writing, sell for $89.99 — to the Charge's $109.99 starting price. You want affordable truly wireless earbuds with Qi charging. You're willing to compromise on polish for a bargain. You don't care about wireless charging. Save some money and go for the Micro instead. You're a perfectionist about your devices — consider the Master & Dynamic MW07 (although those don't have a wireless charging case either).